Phuket's most developed beach offers numerous leisure, sporting, shopping and recreational options along its 3-km long cresent bay. 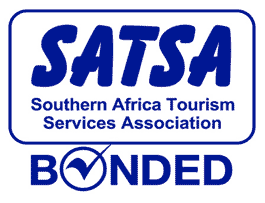 Windsurfing, snorkelling, sailing, swimming and sunbathing number among the many popular daytime activities. 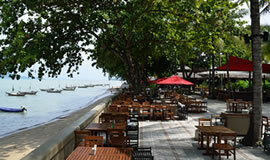 Patong is equally well known for its vibrant nightlife, among which seafood restaurants feature prominently. 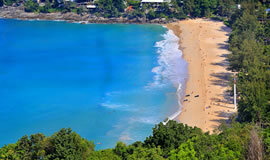 Laem Ka is the only eastern-facing beach in the south of Phuket that offers good swimming. It is very popular with locals so you do get a more authentic Thai experience. It is a sheltered, 150 metre long, boulder-framed beach, ideal for a picnic spot as from midday on it is shady and cool. Children especially like to children splash around in Laem Ka's safe and blue waters. Chalong is generally called a bay, not a beach, because its role as Phuket's biggest boat anchorage is critical to the island, while its beach role is minor. The beach is just a thin, narrow strip of filler sand between water and land. There is nothing remarkable about this beach save the views over the bay to offshore islands and anchored yachts – best enjoyed from a seaside cafe with a cool beer or glass of wine at sunset..
Beautiful Kata is a scenic gem, its clear water flanked by hills, and picturesque Bu island sits offshore. Kata retains a village feel at its northern and southern ends and is perhaps more family-oriented, its beach more peaceful than Patong. Just north of Patong Bay, starting from about the Novotel Resort Hotel Patong to Thavorn Bay Resort, this area consists of rocky but quiet beaches, and an interesting road leading up into hills with high viewpoints and a few good quality restaurants perched on the edge and top. Some housing compounds are now being built on the hillsides and the whole area is steadily moving upmarket. The second largest of Phuket's tourist beaches. Large resort complexes line the road behind of the shoreline, but the long, broad beach itself has no development. The sand is very white, and squeaks audibly when walked upon. The southern point has a fine coral reef stretching toward Kata and Bu Island. Restaurants, bars, tour companies and other non-hotel businesses are at the north end, near the traffic circle, and at the south end, on the little road connecting the back road with the beach road. The narrow road between Kata and Karon has a number of small businesses as well as the Dino Park Mini Golf facillity. 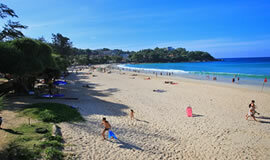 Karon is the most up-scale of Phuket's beaches. There is a regular daytime bus service to and from Phuket Town. South of Kata is Kata Noi, a smaller beach with only a few hotels and little other development. The beach is superb. Many fish inhabit the rocks and corals along the beachless shoreline stretching south. This cosy little bay is found at the end of a beachside cul-de-sac, just a few minutes' drive over the hill from Kata beach. There's not much to do in Kata Noi apart from admiring the wonderful scenery, which is precisely the point of coming here. Relax, take a walk along the soft sands, snorkel or swim. The popular Kata Viewpoint, offering a stunning vista across the three bays of Karon, Kata and Kata Noi, is only a five-minute drive along a winding road towards Nai Harn. South of Kata Noi and north of Promthep Cape, Naiharn is not Phuket's longest beach, but it borders the most gorgeous lagoon on the island. 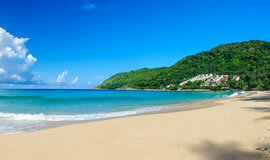 The middle of the beach is dominated by the Samnak Song Nai Han monastery, which has obstructed excessive development and is the reason that the beach is generally less crowded than other spots on the southern part of the island. A wide variety of water sports can be enjoyed, but swimmers should be alert for the red flag which warns of dangerous currents during the monsoon season from May to October. One can walk to nearby Promthep Cape to observe sunsets, which are often fiery and spectacular.